Welcome to Youngstown! - Christian Stoever was called into action quickly after arriving two days earlier from Cedar Rapids. Well, the Phantoms managed to dig themselves out of one of the biggest holes I can remember but were unable to get the second point. Despite being down 6-2 a little over halfway through the game, they manages to tie it a 6 a side before dropping the match in a shootout. Still, getting a point after being down by a 4 goal deficit may be a win when it come to moral and with to more games against the Aces on the immediate schedule we'll need some wind in our sails. 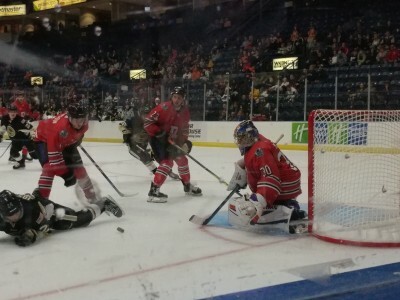 The Aces got off to a great start, scoring on the first shot of the game 1:04 after the puck dropped. Tate Singleton would sneak behind the defense and tip a pass in the crease from Ryan Seidam that Jon Mor had no chance on. Joseph Abate would even it up briefly, a breakaway goal off a blocked point shot that beat Ryan Snowden cleanly at 5:24. The Aces would regain the lead 1:11 later and start to pike it on. Joseph Dunlap would beat More high glove side at 6:35, Trevor Janicke would sneak a puck in glove side, finding a small short side crack from a sharp angle at 8:12. Mor's night would be over when Bradly Marek would rifle a one-timer from the left faceoff circle through a screen at 14:31. Mor exited allowing 4 goals on 12 shots. Welcome to Youngstown Christian Stoever, the newly acquired netminder who had been in town all of 2 days. I was hoping he remembered what color jersey was his teams at this point. Gainfranco Cassaro would get a goal back for us on a two man advantage late on a laser from the point at 15:57. Shots were 12-10 in favor of the Aces after the first. 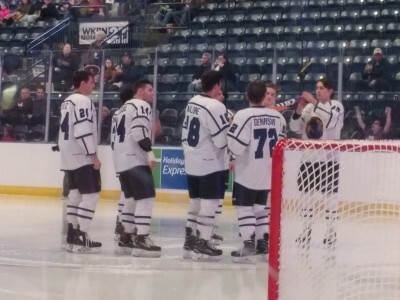 The Phantoms Hoist the Eastern Conference Championship Banner - The Phantoms veteran players celebrate last seasons Eastern Conference championship as they raise the banner. The Phantoms were back at home last night and in need of a win on friendly ice. With the Dubuque Fighting Saints in town to avenge their loss at home to us last Friday, a team we almost always have an exciting game against win or lose, you knew this would be a good test of the team and a fun one for the fans to watch. And it certainly lived up to the billing. The Phantoms would build a lead in the first period and never look back. With the Saint's Verners Egle in the box for a high-stick penalty, Connor MacEachern would send a shot from the point on net with big Brett Murray screening in front of the Saints netminder, Matther Thiessen, that easily found the twine at 7:51. 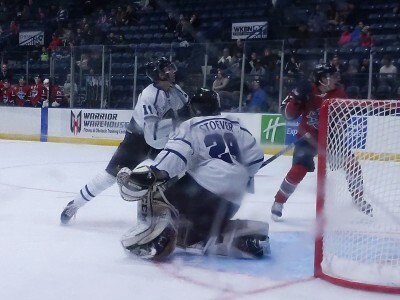 A few minutes after that, a Joseph Abate shot would get kicked aside by Thiessen, but Dalton Messina would be right on the doorstep to shovel it through the crease behind the netminder for Matthew DeMelis to forhand to backhand into the net as Thiessen tried unsuccessfully to slide back over at 10:38. The Phantoms would increase their lead once again on a MacEachern powerplay point shot, again with Murray in front of the netminder at 16:17. The Saints would get one back quickly, 0:25 after, with defenseman Michael Feenstra sending a shot on net from just outside the left faceoff circle with Willie Knierim screening Jon Mor. The Saints would take a 8-6 shot advantage into the first intermission but the Phantoms would have the 2 goal lead. The Phantoms drop a pair to the 'Jacks - The Phantoms only get 1 of 4 points during the home opening weekend. The Phantoms opened at home this past weekend, looking to get things on the right track after not getting any points in the standings during the Fall Classic. We managed to mess that up royally, snatching defeat from the jaws of victory on Friday and barely even showing up to skate on Saturday. We did manage to get 1 point for a regulation tie on Friday but that wasn't enough to lift us out of the basement, leaving us in 17th place out of 17 teams. To make it worse, both losses were against out divisional rival, the Muskegon Lumberjacks. Friday's game was a battle of goaltenders. Jonathan Mor starting in net for the Phantoms and Brandon Bussi for the 'Jacks. Through most of the first half of the game, it didn't look like either netminder was going to give an inch. It was scoreless until the 7:31 mark of the second frame when Conner MacEachern managed to jab home a shot from Jack Malone off a faceoff to Bussi's right to give the Phantoms a 1-0 lead. They would hold the slim margin until the waning moments of regulation when, with Bussi off for an extra man, former Phantom Jagger Joshua returned the favor off a James McIssac point shot with 0:48 left on the clock. Neither team would score a goal in the 3-on-3 OT, despite the Phantoms having 1:53 of powerplay time to close the frame. Only the 'Jacks Bobby Lynch would score in the shootout, weaving through the slot before going with forehand, top shelf shot on Mor's glove side. Shots were even at 32 a side, the Phantoms 10-12-9-1 and the 'Jacks 10-9-11-1.